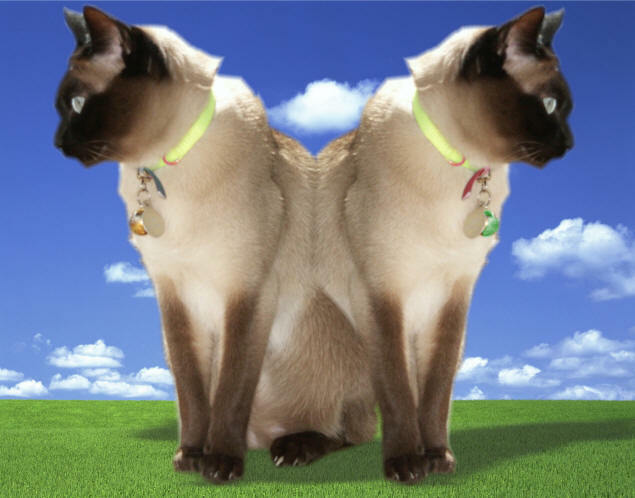 Here's an actual, retouched, photo of genuine Siamese twin cats. Fauxtography is the word, recently coined, for special effects photos that seem to display something that can't (or, at least, doesn't) exist in reality. You know, like a photo of one person that looks like twins, or of a person floating in mid-air, or of an empathetic Republican. Below you'll find links to my posts about, or displaying, fauxtography. My new Canon Powershot G10 camera that I got from my daughters Jenny and Karen for Christmas, has so many features that I haven&apos;t yet learned to use them all. But I am trying to pick up a new technique each week. And this week, I discovered a couple of features that I would never have guessed a camera has, or needs. They are called "Color Swap" and "Color Accent". Twins run in our family. This photo, taken in the summer of 1966, was my very first attempt at creating "twins". The subject is my step-grandmother, Dorothy Weems Brown. I used a Kodak Brownie Twin Lens Reflex, because I knew I could take double exposures with it. The camera was mounted on a standard tripod. I ran a black thread down the viewfinder for reference, and hand-held a sheet of black construction paper over half the field for the first exposure, then, after Gramma had switched chairs, over the other half to complete.